Amaranth leaves are easily available here in Indian stores and in farmers market in summer . One of the Kerala special recipe with this vegetable is cheera thoran . 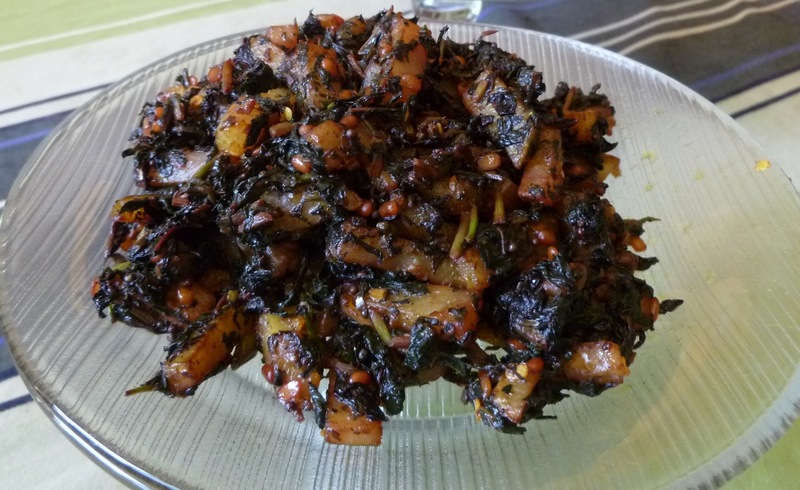 The recipe here is aloo and amaranth leaves and goes well with rice or roti. Make a coarse powder of cumin and red chilli. Heat oil and add the urad dal. When it turns golden add the potato and onion. Mix well and cook till onion turns golden around edges. Add the turmeric, cumin and chilli powder and mix well. Add the amaranth leaves and mix well. Cover and cook on medium flame till the water is evaporated. How I wish I could get Indian greens here..except palak we don't get any..I miss them. Fantastic stir fry, simply love this combo..
Greens. I love them and this would be delicious. Simple food these days are very refreshing. I love your amaranth potato curry. I see these leaves in the farmers market and I don't buy them, but now I have a reason to buy. The photo of the curry is perfect. healthy and delicious combination.. Yummy !! A different kind of curry. Will try soon. loved it....never used these leaves before !! !delicious combo !!! !